Nutmeg comes from an evergreen tree indigenous to Indonesia. Whether it’s baked into spice cake or blended into tea, this pungent spice offers a warm, nostalgic taste and aroma. Steam distilled from the fruit and seeds of the tree, Nutmeg Vitality™ essential oil has a sweet and distinctly spicy taste, making it both a powerful and versatile essential oil. Nutmeg Vitality™ is particularly good for enhancing the flavor of winter produce such as acorn squash, sweet potatoes, and pumpkin. Along with flavoring your favorite recipes, Nutmeg Vitality oil has many health benefits, including cognitive function support, immune support, and powerful antioxidants. 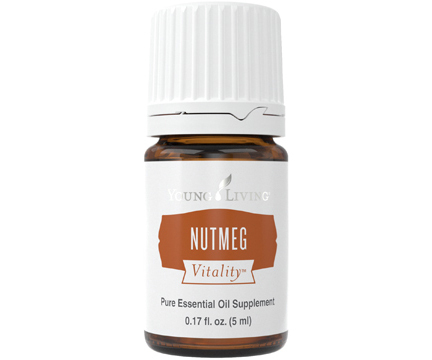 * Nutmeg Vitality Essential Oil Uses: Take it as a dietary supplement to experience its cleansing properties and to support a healthy lifestyle. * Put 1 drop of Nutmeg Vitality and 1 drop of V-6™ Vegetable Oil Complex into a capsule and take it to support cognitive function. * Place 1–2 drops into a smoothie or green drink to support a healthy immune system. * Add Nutmeg Vitality to your favorite holiday baked goods. Use it in savory dishes to subtly enhance and round out the flavor. Add 1 drop to a glass of eggnog to enhance this sweet and spicy treat. *These statements have not been evaluated by the Food and Drug Administration. This product is not intended to diagnose, treat, cure, or prevent any disease.